Reminding me of a taller and slimmer James Whitmore, television mainstay John Anderson was often seen as rugged and solemn looking, but could also play comedy when required. One of those faces that I always remember from my childhood, he would occasionally crop up in some now-classic movies in between his many small-screen appearances. Born on October 20th 1922, Anderson spent his first acting years mainly in television before having a brief bit in the Kirk Douglas western ‘Last Train from Gun Hill’ (’59). Some of his memorable small-screen performances at this time were in the sci-fi favourite ‘The Twilight Zone’ and the Chuck Connors series ‘The Rifleman’. 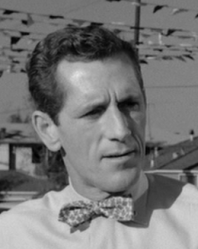 Anderson’s first notable movie role was as the suspicious car salesman “California Charlie”, in Hitchcock’s ‘Psycho’ (’60), after which he played Wyatt Earp’s brother Virgil in the popular series ‘The Life and Legend of Wyatt Earp’ (’60-’61). After playing a preacher in the Jane Fonda drama ‘Walk on the Wild Side’ (’62) Anderson was Warren Oates’s brutish brother in Sam Peckinpah’s ground-breaking western ‘Ride the High Country’ (’62). A sci-fi flick came next with the entertaining doomsday feature ‘Satan Bug’ (’65) playing a security chief, followed by the sporadically funny comedy-western ‘The Hallelujah Trail’ (’65), as Burt Lancaster’s loyal sidekick Sergeant Buell. There followed a cameo as Abraham Lincoln in Billy Wilder’s strangely serious comedy ‘The Fortune Cookie’ (’66), and then he was a District Attorney in the sadly forgotten drama ‘A Covenant of Death’ (’67). More westerns followed with ‘Welcome to Hard Times’ (’67) in which he played twins, and then as the town marshal in the Dean Martin poker mystery ‘5 Card Stud’ (’68). Trading horseback for Harlem Anderson then played a tough police superior in Ossie Davis’s Blaxploitation piece ‘Cotton Comes To Harlem’ (’70). One of the roles that I mostly remember John for was his Indian-hating colonel in the still-controversial western ‘Soldier Blue’ (’72). I can still picture the scene where Peter Strauss’s embittered soldier memorably places a needlessly murdered young child in his lap, during the movie’s almost unbearable to watch final massacre. In a change of pace Anderson co-starred with Joseph Bottoms in the rather touching romancer ‘The Dove’ (’74) before playing a trio of American Presidents. First he was Andrew Jackson in the 1976 television movie ‘Bridger’, then another turn as Lincoln in ‘The Lincoln Conspiracy’ (’77), and finally Roosevelt in the 1979 mini-series ‘Backstairs at the White House’. Just as busy in the 1980’s as he was in the fifties, Anderson played the town governor in the fun sequel ‘Smokey and the Bandit II’ (’80) and later had one of his best roles as baseball commissioner Judge Kenesaw Mountain Landis in John Sayles’s baseball drama ‘Eight Men Out’ (’88). On television at this time he had the recurring role of oil executive Herbert Styles in ‘Dallas’, and was great fun as MacGyver’s grandfather Harry Jackson in a handful of episodes of that popular adventure serial (’85-90). After a couple of more television appearances including a memorable ‘Quantum Leap’ episode, John Anderson died in California on August 7th 1992, he was 69 years old. A versatile actor with over 240 screen credits, John worked steadily for 40 years and was a much-loved actor whose sombre looks and mannered speech kept him prolific throughout his long and distinguished career.